One shuts down the brain. The other activates it. 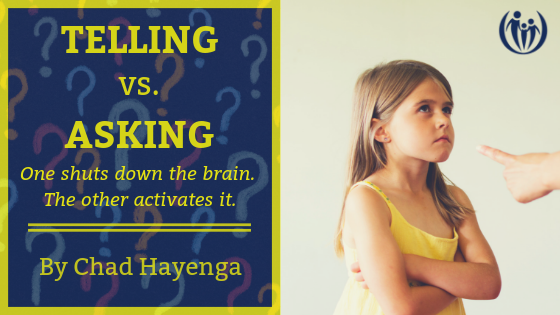 What’s the difference between telling and asking? I’m a teller by nature. It seems easier. Maybe just more efficient, really. I tell my child what to do and then she does it. I tell her the answer to the question she asked and she submissively accepts it; no (more) questions. That may be some kind of parenting dream world. But it sure isn’t reality. And when we really consider the implications of this type of parent/child relationship the short-term peace we accomplish does not bring about the long-term life skills we desire. We’ve also seen that kids who consistently are told what to do can easily become dependent on others’ directives. They don’t grow their ability to look around and see what needs to happen. Instead, they rely on other people to tell them what to do and when to do it. 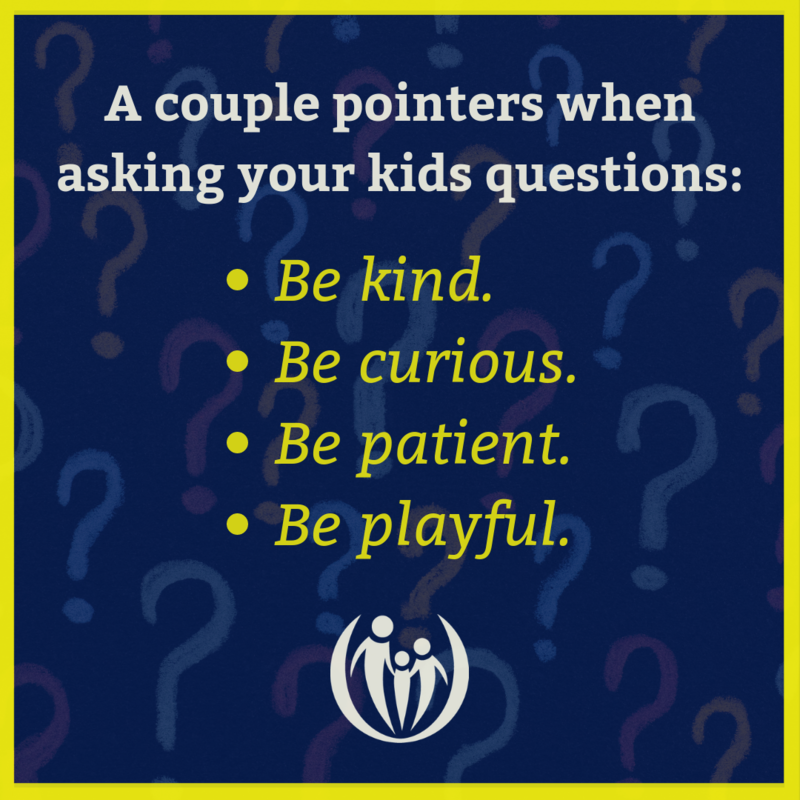 In my experience coaching hundreds of parents over the years, I’ve encouraged them to ask questions of their kids to activate higher-level thinking. What parents often say: Get ready for bed! What time is it? What usually happens at about this time? What are all the things that need to happen to get to bed on time? What do you want to do first? What happens if you make it to bed on time? You get to affirm your child for responding well to your questions and acknowledge how responsible they are becoming. You can lovingly affirm good choices and still gently hold your child accountable when things have gotten off track. What parents often say: Do your homework! How are things looking for homework tonight? How long do you expect it to take? What’s on the calendar? Are there other things that are going on tonight that are important to you or others? You learn to hear your child’s perspective. The responsibility and time management of doing homework is placed primarily on your child. You help your child remember the expectations and consider what else may be on the family calendar for the evening. When I coach parents, I encourage them to have the long-term goal in mind. Questions are not a magic pill or quick fix that will turn your child into an expert at immediate obedience. When you begin asking more questions, you are likely going to be met with a lot of “I don’t know” and/or shoulder shrugs. This approach will likely be new to your kids and they may not know what to do with it, so expect some growing pains as they learn a new way of doing things! Over the next week, put some effort into noticing how much you tell vs. how much you ask. Have you found that you’ve been over-the-top in your demands? Consider confessing to your kids that you’ve been impatient lately and that you’d like to change. Ask them if they have any suggestions about how you could be less ‘bossy’. 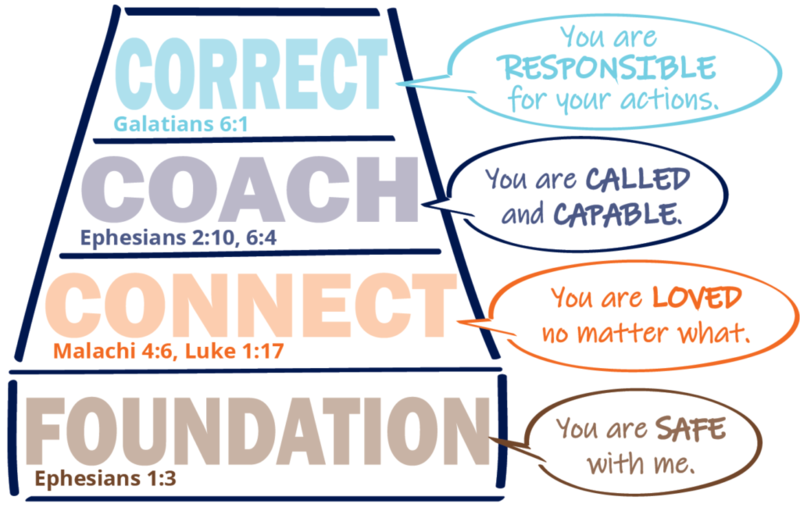 As your kids become confident in what is expected of them, they may begin to proactively take on more responsibility. The result over time? A greater sense of peace and connection in your home.